William “Will” Simpson is an artist whose career can be divided into two parts. He began his professional work drawing for British anthology Warrior, as well as Judge Dredd and Rogue Trooper in 2000 AD. He moved on to illustrate DC’s Hellblazer, working with fellow Northern Irish creator Garth Ennis. He also drew Aliens for Dark Horse and Vamps for DC’s Vertigo imprint. Then, when Northern Ireland’s film and TV industry really took off, he switched to working in that creative arena. Since 2013 he has been the storyboard artist on HBO’s Game of Thrones TV series, which finishes this year. But he does still draw the odd comic and is working on something in that medium currently. 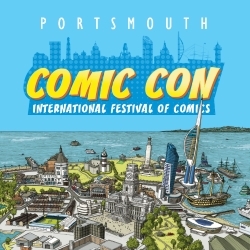 This is Simpson’s first visit to Portsmouth Comic Con. His work features in Masters Of Comics, a book on artists and illustrators and their studios, with early copies available at Portsmouth from the Tripwire table. His Game of Thrones art will also be exhibited at the show, showing off his character designs for many of the show’s most recognisable characters including Jon Snow, Daenerys Targaryen and more.